Is Maz Kanata in Han Solo? With production still under way on Disney and LucasFilm' Han Solo spin-off, under the direction of Ron Howard, the studios haven't released any official plot details as of yet, as we continue to get closer and closer to the May 25, 2018 release date. A new rumor has surfaced from a podcast where a Funko representative named Mark was discussing how excited the toy company was about th Han Solo release, touting cast members such as "Emilia Clarke, Lupita Nyong'o, Donald Glover, Woody Harrelson." Since Lupita Nyong'o has never been mentioned as part of this Han Solo spin-off, many are wondering if her Star Wars: The Force Awakens character Maz Kanata will actually be part of the story. This interview happened on the Steele Wars podcast, although there has been no direct confirmation from LucasFilm that Lupita Nyong'o or her Maz Kanata character will be a part of the Han Solo spin-off, but if its true, she will certainly be considerably younger. 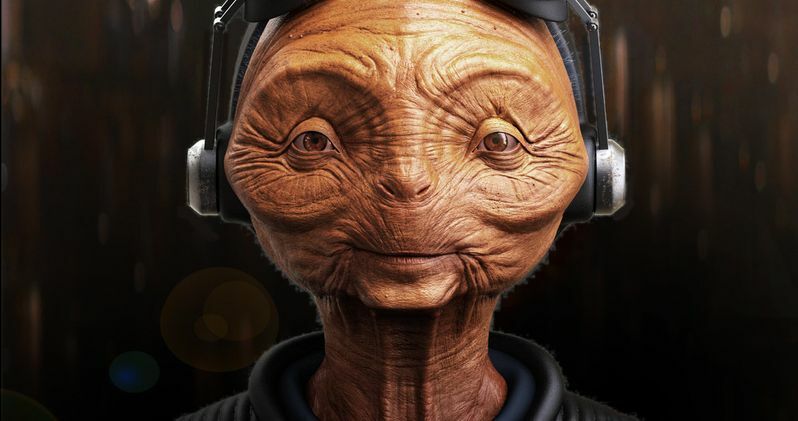 Star Wars: The Force Awakens was set 32 years after Return of the Jedi and the Han Solo movie is set 10 years before A New Hope, but it has been established that Maz Kanata was born more than 1,000 years before the events of The Force Awakens, so she will certainly be alive during this story. We first met Maz Kanata when Han Solo (Harrison Ford) took Rey (Daisy Ridley) to Maz Kanata's castle, where she was given the lightsaber that belonged to Luke Skywalker. Upon touching this ancient Jedi weapon, Rey had what has come to be know as a "Forceback," where she saw events from the past unfold, revealing that Rey is "Force sensitive." Unfortunately, Maz Kanata's castle was destroyed in an attack by the First Order shortly after Rey and Han arrived at the castle, but if Maz does in fact show up in this Han Solo spin-off, perhaps fans will get to learn how Han and Maz first met, while getting another glimpse at her castle from several years earlier. Still, there is no confirmation of these plot details, but since this is said to be a Han Solo origin story, it would make sense to show how he first came in contact with Maz Kanata. Still, there have been no reports of Lupita Nyong'o on the set since production began, but it's still unclear why the Funko representative included her name along with several other confirmed cast members of the Han Solo spin-off. Perhaps he was confusing that movie for Star Wars: The Last Jedi, which Lupita Nyong'o's Maz Kanata is returning in, but that has yet to be confirmed. It remains unclear when production may finally wrap, since we may get our first confirmed plot details then. New director Ron Howard has been offering fans some tantalizing clues through his social media feeds, with the latest photo hinting that the Death Star could have a presence in this movie. Still, that hasn't been confirmed either. Despite the brief delay that happened when LucasFilm surprisingly fired Phil Lord and Chris Miller with just a few weeks left of production, LucasFilm has been adamant that the May 25, 2018 release date will remain unchanged. Hopefully we'll have more on this Han Solo spin-off in the very near future.